The internet loves all creatures great and small. In the past, we’ve seen cat memes take over social media, laughed at the silliest of pet gifs, lost countless hours watching cute critter videos on YouTube and generally given anything with four paws a definite ‘like’. There are an abundance of animal lovers on the internet who are eager to discover and share the next Grumpy cat with their followers. While the natural kingdom and the higher education realm might not seem like an obvious fit, every once in a while opportunities do present themselves which are just too good to pass up. It’s up to your university or college to recognize these golden opportunities and take advantage. We’ve blogged previously about the incredible success Keele University have had with their recent recruitment campaign which promotes a troupe of dancing squirrels. Keele University aren’t the only university however who are using the local inhabitants of their campus to promote their institution. In the April edition of The Chronicle of Higher Education magazine, we came across an article about Berry College and their most famous of inhabitants; a pair of Bald Eagles. 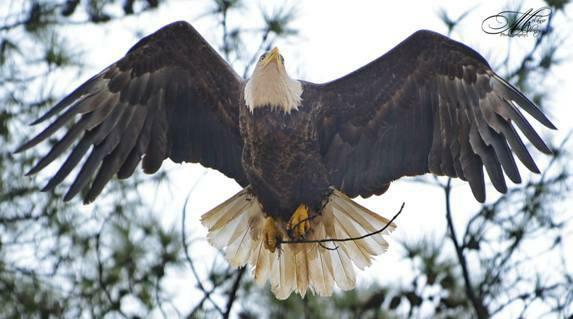 In the spring of 2012, a pair of bald eagles arrived on the college’s Georgia campus and for a few months made the upper branches of a tall pine tree their very own dormitory. When they returned to the 27,000 acre campus that fall, they raised two eaglets before all four majestic birds flew away. The college made the decision that they would be ready if the majestic birds should return the following fall, deciding to install a camera which would offer a rare insight into what goes on inside the nest of bald eagles. Sony donated a camera and Georgia Power sent workers and a bucket truck to install it above the nest. In September 2013, the birds returned to their nest and became stars of their very own reality show. For the first few months, unique views were somewhat slow, totalling around 413,000. However, the numbers began to skyrocket when the female laid two eggs causing the college server to crash from all the attention. By the beginning of February, the cam had one million views and a week later traffic spiked again when a local news programme circulated video footage of the female protecting herself and her unhatched chicks from a great horned owl. In early February, the first chick hatched and viewers were hooked. The college organized a live web chat with Renee E. Carleton, an associate professor of Biology at Berry, who expertly fielded questions about the eagles, including why the second egg never hatched. Not only did the eagles and their chicks go viral but so did the small college of just 2,100 students. By early April, the eagle parents and their little chick had received more than 9.5 million views and the facebook page has more than 50,000 likes. The eagle cam has given Berry College the worldwide exposure they could otherwise only have dreamt about. It’s elevated their status from a little college in the state of Georgia to a household name in schools across America. High schools everywhere are streaming the eagle cam to classrooms full of future applicants who may not remember a college with a great science programme but who will always remember Berry College and their infamous bald eagles. For those colleges or universities not lucky enough to have bald eagles living on campus, you might be wondering just how you can take advantage of the internet’s love affair with the animal kingdom. While we don’t recommend, you fake a coveted sighting of a rare snow leopard on your campus, there are more creative ways to take advantage of everyone’s love of cute critters. For example, Trinity College recently held an exam Destress Canine Therapy afternoon. The university invited students to come along and reduce their stress levels by petting some trained therapy dogs. The event was a huge success with students and faculty readily tweeting happy snaps of their four legged therapists. The University of Portland, Oregon recently persuaded a puppy named Coda to takeover their Instagram and Twitter accounts. The quirky social media campaign was a huge hit among students and saw them get a huge increase in their social media followers. So whether you’ve got squirrels running riot on your campus, rare birds nesting in your trees or just know a dog who might be willing to star in a social media campaign, animals; domestic or wild can increase traffic, brighten up your student’s day and make sure that prospective students remember who you are when the time is right.